Forgotten Hollywood » Blog Archive » “Forgotten Hollywood”- A Really Bad Week… A Great Day! “Forgotten Hollywood”- A Really Bad Week… A Great Day! 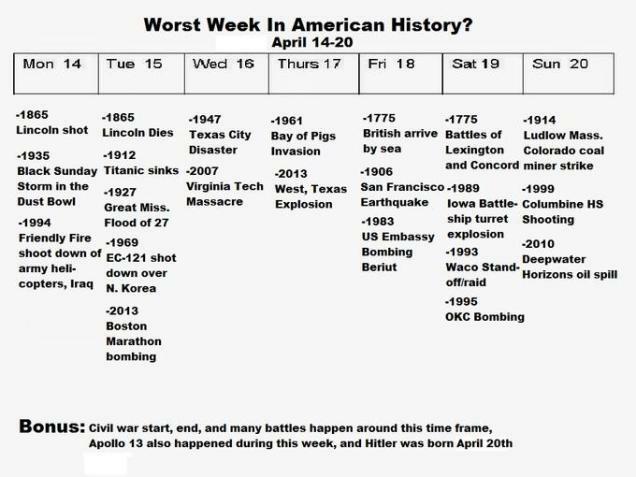 History buffs might not know this, but it seems—April 14th to April 20th—appears to be the worst week in American history. For example, the assassination of President Lincoln, the great San Francisco earthquake, the sinking of the Titanic, Bay of Pigs invasion, Columbine shooting, Oklahoma City bombing, etc. all happened during this seven-day period in history. This year, factor in Good Friday, and you get the point. This is my 1000th blog story. I began this journey into Forgotten Hollywood in September of 2009. I never dreamed I would be announcing this milestone 4 1/2 years later. During this period, I received accolades from the Los Angeles Press Club and a litany of folks. Thank you for your continued support on this wonderful milestone! Have a great day… Happy Easter! This entry was posted on Sunday, April 20th, 2014 at 1:28 am	and is filed under Blog by Manny Pacheco. You can follow any comments to this post through the RSS 2.0 feed. Responses are currently closed, but you can trackback from your own site.